HomeAlzheimer's diseaseEvery 66 Seconds Alzheimer’s Afflicts an American. How to Avoid Being One of Them? Alzheimer’s disease (AD) is constantly in the headlines these days. Americans, especially seniors fear this degenerative condition more than even cancer. It starts as a type of progressive brain disorder that slowly weakens cognitive skills. Symptoms get worse over time, eventually affecting the ability to carry out even the simplest everyday tasks, ultimately leaving victims as the shell of their former selves. According to The Alzheimer’s Association, a non-profit American health organization, which focuses on research for Alzheimer’s disease, approximately 5.5 million Americans of all ages currently have AD. By 2050, this number could surpass the 16-million mark. Increasing age is the greatest known risk factor for Alzheimer’s. However, nearly 200,000 Americans under the age of 65 experience an early-onset, and the number is soaring. Projections about rising Alzheimer’s incidence rates, no doubt, paint a grim picture, but believe us, it is possible to reduce your odds of developing AD. How? By leading a brain-healthy lifestyle. Alzheimer’s has multiple risk factors. You cannot control all of them. You cannot, for example, turn your biological clock or change your genes. However, there are other risk factors, including your metabolism, blood pressure, and insulin levels that you can keep in check. Watching what you eat is one of the ways to optimize your brain health and preserve your cognitive abilities. How Can A Brain-Healthy Diet Help? The research and resources from around the world have proved that the right diet can slow down, or even reverse, the process of progressive brain disorder. This nutritional approach is premised on the simple notion that the food you consume either damages or nourishes your brain cells. Also, there is a strong link between Alzheimer’s and metabolic disorders, as inflammation and insulin-resistance damage neurons, affecting their signal processing abilities, ultimately hampering communication among brain cells. No wonder, Alzheimer’s is referred to as ‘diabetes of the brain’ in the medical circles. Embracing brain-friendly eating habits can help reduce inflammation and supercharge your gray cells. Some food items are rich in nutrients that help repair and replenish brain cells. They help in the release of neurotransmitters or brain chemicals that influence your mood and thoughts by facilitating communication among neurons in your brain. Various cold-water fish, fruits, vegetables and whole grains help balance neurotransmitter in your body, promoting mental well-being. These are called brain foods which you should add to your daily diet. In this post, we will tell you about some of the best among them – not something exotic, but everyday items that you can find in your kitchen throughout the year. Omega-3 EFAs are building blocks of brain cell membranes and nerve cells.Unfortunately, according to some estimates, 70 percent of Americans do not get enough of this nutrient. But the condition of your brain cells depends to a significant extent on the availability of these healthy fats, high on anti-inflammatory qualities. Fatty fish like tuna, trout, sardines, salmon, and mackerel are not only rich in Omega-3 fatty acids but also protein (boosts your happy-hormones like serotonin and dopamine) and vitamin B12 (essential for a healthy nervous system). No wonder, fish occupies the top slot on the brain food list. Eat at least 12 ounces of fish every week to give your brain the nutrients it needs. A Point to Remember: While buying your oily fish, choose the low-mercury varieties like sardines, mackerel, and herring. A few people know that this universal breakfast staple is an excellent memory booster. Rich in choline, a type of neurotransmitter, eggs give you a sharper memory now and will keep your mind focused as you age by enhancing communication among brain cells. If you have been avoiding eggs because of its cholesterol contents, it is the time that you bring them back to your refrigerator. Even the American Heart Association no longer urges heart patients to stay away from eggs. So, eat two to eight eggs per week without any hesitation. A Point to Remember: Eat both the yolk and the white. Brain experts call this creamy fruit from the berry family as the world’s most perfect food. It is hardly surprising given the fact that avocados facilitate the production of acetylcholine, which boosts memory and improves the clarity of thinking. Also, they supply vitamins C, E, K, and the B complex – nutrients that your brain needs in high quantity. Moreover, this superfood’s high tyrosine content keeps you motivated and focused. A Point to Remember: Include them in your salds and smoothies. Know what? Following a diet rich in olive oil can reduce the risk of Alzheimer’s up to 40 percent, as Oleocanthal, an anti-inflammatory agent present in it helps the brain get rid of the beta-amyloid proteins associated with progressive degeneration. Free of harmful trans-fats, and rich in vitamins E and K, and monounsaturated fats, olive oil boosts memory and prevents mental decline. Just two tablespoons of olive oil every day can help offset stress effects on the brain by increasing the BDNF (brain-derived neurotrophic factor) level. A point to Remember: While buying your olive oil, always buy the variety labeled Ultra Premium (UP). An excellent source of antioxidants, anti-inflammatory, and neuron-friendly nutrients, turmeric helps fight depression. The root of a tropical plant native to India, turmeric contains a great variety of active compounds; a substance called curcumin is the most important among them. Acting as a ‘brain fertilizer’, it raises the BDNF level and helps remove the plaques that damage brain cells. A Point to Remember: Use half a teaspoon of turmeric powder in your dishes. Alternatively, you can consume turmeric tea daily for better curcumin absorption. The number of Americans living with Alzheimer’s disease is soaring. But you can keep the condition at bay. All that you need to do is create a brain-friendly strategy. 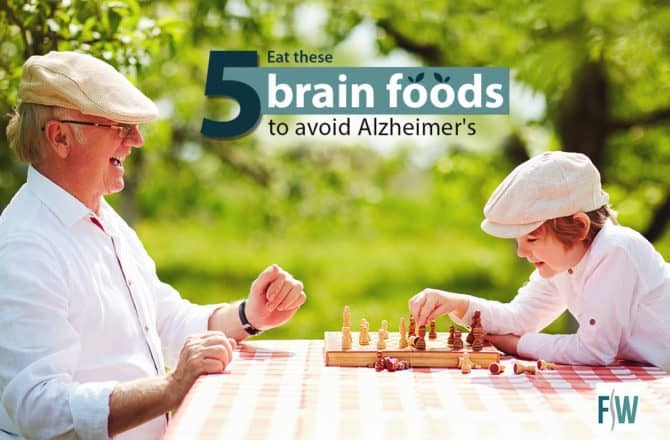 Take the first step towards outsmarting Alzheimer’s by redesign your diet plan. We have just told you how to go about it. Eat right now to keep your brain cells nourished for years to come. After all, you live only once and you should enjoy your life and stay productive till you reach the end. If someone in your family has Alzheimer’s or you learn that you may be at high risk for this disease, we at Florida Wellness can help. Contact us for the proper treatment plans, as well as consultations on brain-healthy lifestyle changes.